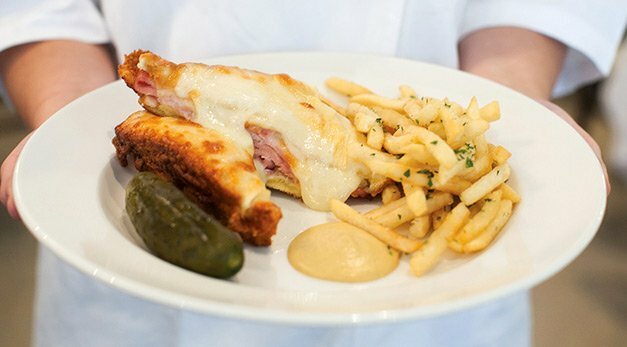 Bistro Classics: The Luminary’s croque monsier. Walk into Atlanta’s warehouse- like Krog Street Market and you enter this city’s electric new dining phase. From the moment you pass Hop City’s aisles of craft beer and wine and move into the bustling market, where singles, families and kids crowd picnic-style tables to chow down on hamburgers from Fred’s Bread and Meat or charcuterie from the Spotted Trotter, dumplings from Gu’s or falafel from Yalla, you get an inkling of the multitude of new options being unleashed in this town. Along with Buckhead Atlanta and the still-incubating Ponce City Market, this food-centric space in red-hot Inman Park seems to directly serve its neighborhood, but actually addresses the way almost everyone wants to eat these days: You want it freshly made, from sources you trust, and an almost endless variety of choices. Gone are the days when you went to a huge mall to shop at the best stores, which competed fiercely to offer the most exciting new products – and endured something terrible from the food court. Now that exciting, fiercely competitive mall is the food court. More is coming to KSM, including a stall from Asha Gomez (Spice Road) and a yet-unnamed sit-down space from a team including famed bartender Greg Best. At press time, the full-service spots are Ford Fry’s new “Mex-Tex” place, Superica; Chef Jey Oh’s Craft Izakaya; the pleasantly smoky environs of The Cockentrice, famed for its Spotted Trotter charcuterie; and The Luminary, a French bistro helmed by former Top Chef contestant Eli Kirshtein, and named for Atlanta’s first newspaper. The Luminary represents something of a homecoming for Kirshtein, an Atlanta native. He earned his classic French cooking chops with stints at New York’s Le Bernardin and Atlanta’s Joel. With its glossy white tile, oyster bar and clean lines, The Luminary is well-positioned to be KSM’s grown-up dining spot – on a recent weeknight, Craft Izakaya was as boisterous as a high school cafeteria, and Superica had the quirky vibe of Roy Rogers’ rec room, as designed by Tim Burton. The Luminary is quiet enough for conversation, but lively enough for a special occasion. The wine list and craft cocktails encourage celebration – the Kentucky Gambler (served on Derby weekend), with “strong tea,” bourbon, mint, lemon and “clarified milk,” was outstanding, as was the simple but happy combination of Calvados and sparkling rose, with a lemon twist, named for the French singer Plastic Bertrand. There is also much to like on the menu, starting with icy oysters (James River and Bodie Island on our visit), with horseradish, cocktail sauce and mignonette. The best dish of two visits was asparagus soup, with garlic puree, garnished with tender tips, crisp pastry and dotted with snails, like a clock face. This alone, with the wheat-stalk epi bread and good butter, would bring me back. The sweetbreads, tiny, tender fried cubes among roasted Brussels sprouts and caper-raisin puree, were so small as to be insignificant in an otherwise intriguing and pretty dish, dotted with thinly sliced radishes, mustard seeds and parsley. On a second visit, we inhaled the mussels in creme fraiche-Dijon sauce. The Luminary offers French bistro classics both fussy and plain: You can order a croque monsieur (grilled ham and cheese with bechamel) or hanger steak with Maitre d’Hotel butter and frites. There’s also duck, rabbit, fish or a half roast chicken. Our initial visit’s dinner (swordfish “amandine” with pecans, capers, celery root puree and flash-fried kale; half roast chicken with fennel, ramps and smoked chicken jus) was a mixed bag. I loved the silky, sautéed ramps and fennel, and wanted to sop every drop of the tea-colored smoked chicken jus. But the chicken itself was dry – both the white and dark pieces – and the skin leathery, far from the tender, crisp-skinned roast bird that should be a staple for any self-respecting French cook, not to mention bistro. My dining companion adored the swordfish, declaring it one of his favorite renditions of his favorite fish, but I found it also slightly overcooked, not to mention overworked with garnishes, the capers, pecans and kale overwhelming the root puree and fish. On a second visit, however, turbot in parchment, served with asparagus risotto topped with a raw egg, was flawless, with intriguing layers of subtle flavors and supple textures; the seared scallops with carrots and fresh peas were solid if unremarkable. The duck leg, however, on Carolina gold “dirty rice,” despite its interesting plays on sweet and savory, was also dry. On both visits, desserts redeemed the meal – a coffee financier (cake) with salted caramel ganache and milk chocolate mousse touched all the bases with a beautiful presentation that was both sophisticated and satisfying. The spring pea ice cream “sandwich” was the standout surprise, with thin dark chocolate cookie enclosing the lightly sweet and pleasantly vegetal ice cream, topped with fresh pea tendrils. French press coffee powered us out the door and into the bustling neighborhood Inman Park has become. That kind of growth and maturity is just what’s needed in this youth-oriented neighborhood and in KSM: Someone needs to be the grownup in the room. This month, Kevin Gillespie, right, (Gunshow) plans to open the doors to his new Decatur restaurant, Revival, featuring “elevated Southern fare,” with dishes like country-fried grass-fed beef round steak with skillet pan gravy. The patio will feature an outdoor bar, to be called Communion, opening this fall. 129 Church St. (the old Harbour House Pub site). www.revivaldecatur.com.